Podolka has two locations – one right by the river in Podolí and the other in Karlín. Neither of them is a gluten free restaurant as such but many items on their menus are gluten free. You will see allergens listed along with each menu item (gluten is marked as no. 1). We were told that gluten free meals are handled safely enough for celiacs and we had a good experience eating here. Podolka’s signature tomato soup is gluten free as are (at the time we write this) all the appetizers, which can be served with rice cakes instead of regular bread. The restaurant has a nice selection of vegetarian meals as well as organic beef burgers and a few seafood specialties. You can also order a gluten free dessert to finish off your meal. 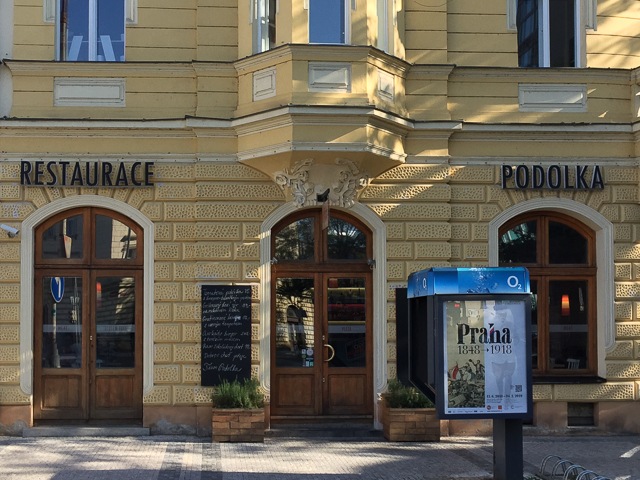 As is common in many Czech restaurants, Podolka serves a special lunch menu on week days from 11:00/11:30 a.m. to 2:00 p.m. It consists of soup and one of several main meals, some of which are gluten free. Podolka prides itself in using pure, natural ingredients. They avoid MSG and other unhealthy additives.